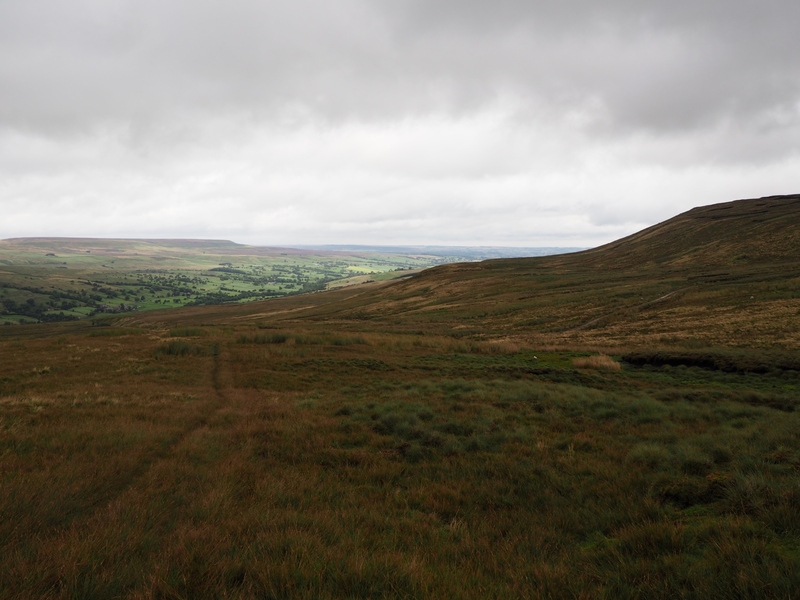 A fairly rough moorland walk from West Scrafton on to Dead Man’s Hill with some great views of Coverdale, a couple of tarns and a hidden gem of a waterfall. After a grand walk the previous weekend on Whitaside Moor I was keen to get back out on to a moor to enjoy some more of the purpling heather. With this in mind it also seemed a good time to explore another section of Coverdale. West Scrafton is a lovely little village on the south side of the valley. Parking is very limited but thanks to Google Earth I spotted a place where 2-3 cars can be comfortably parked off the road just opposite the W Scrafton sign at the western end of the village. As the weekend got closer the weather forecast had deteriorated and both Paul and I donned our waterproofs from the get go. Indeed the skies did look ominous at the start but in fact for the first few miles we only had a couple of brief showers. Even better, as we passed Swineside and followed the bridleway across Swineside Moor and Hindlethwaite Moor, there was even some fleeting spots of sunshine. This bridleway, which was indistinct in places, provided some grand views both up and down the dale. Both Harland Hill and Pen Hill were well seen across the valley. The highlight though was when a burst of sunlight shone down on the village of Horsehouse like a torch. After we crossed Arkleside Gill we took the left hand and most direct of two tracks climbing Arkleside Moor. As we climbed higher the weather began to close in and the breeze began to pick up. At the top of the track we took shelter behind a wall corner to have an early lunch and see if the rain would pass over. This plan initially seemed to pay off when, after lunch, the sun briefly came out again a couple of times as we made our way across the grass and heather to the unmarked top of Dead Man’s Hill – surely one of the flattest summits in the Dales. At this point the weather deteriorated again and rather than passing showers it coalesced into persistent rain for the rest of the walk. From the ‘top’ of Dead Man’s Hill we headed north-east to a fence which we then followed to our next objectives – Woogill Tarn and Coverdale Tarn. It had been about 11 years since I’d last visited these two tarns and I was keen to get some newer photos. Unfortunately conditions were hardly conducive to good photography! After negotiating the numerous watery channels around Woogill Tarn we made our way to Coverdale Tarn and then up on to the top of Great Haw. From Great Haw we followed the fence north towards Little Haw a short way before turning off on the non-existant footpath descending Rowan Tree Gill. After crossing the stream below a circular sheepfold we next negotiated a large area of reeds before finally coming across a path of sorts on Middle Rigg. Despite the weather this was another nice stretch with Lead Up Gill below us and Great Roova Crag looking very prominent up to the right. After recrossing the stream we next went in search of a couple of waterfalls I’d first visited back in March. The approach to both was made a lot harder by the bracken that had sprouted up in the last couple of months. The finer waterfall of the two is Great Force, a superb drop hidden away in a little gorge – an atmospheric and secretive place. Scrambling back out of the gorge we then followed a thin path across the grassy moor to eventually drop back down to Great Gill just before it enters West Scrafton. This path, which is not marked on the map and which does not coincide with the official right of way was particularly enjoyable in its final stages. Finally we reached West Scrafton, thoroughly wet but happy, especially Paul who actually enjoys walking in wild and wet weather. While conditions weren’t great the few miles in the morning when the sunlight was being chased along the valley by the showers was worth the soaking we got later.